We sent you on the 20th inst. the books you had asked for, viz. (1) The Psychology of Nonviolence and (2) Economies of Khaddar. You will please acknowledge receipt of the same. Source: Photocopy in the files of Holger Terp. What a joy to receive such a kind little letter from you. Thank you so very much. I had one of my bad days with headache and depression. I felt rather sick when I got it but grew quite well when I read it. Yes, it would have been nice, if we could have met each other oftener. But I dont complain. I went to most of your meetings, and I attended more than twenty times to the evening prayer. But I always felt, that I had no right to take your time. But now when you have been so kind to say, that you would have liked to have seen more of me in India, I will ask you to remember, that I am a Dane, and that one of our best old Danish proverbs goes: if you give the devil the little finger, he will take the whole hand. I need so terrible to have a chat with you, as you once offered the American teachers in Allahabad. But the present situation is much more at your advantage. With the thousand miles between us you need neither to listen nor to answer. And after all I shall ask no questions. I only want to tell you the most important things, people say about your going to London. They pretend to know, how well you have armed yourself for this round table fight. First you have chosen the six best Indian experts in military, ecconomical and commercial affaires, in Indian debts to England, in safeguards and in foreign affairs. I have only read, that you have chosen five of the working committee as your companions. But people know even better than papers. Another thing they say is, that you have sent your best men to the German General Ludendorff to ask him to point out the first expert in drilling of officers and have him make a calculation about the time necessary for Indianizing the Indian army. With that paper in your pocket you will go to London, and when the Englishmen begin to speak about 20-15 years of safeguards, then you will produce that document and tell them to put that in their pipes and smoke it. Further they say that you have decided to bring nobody but Indians with you, as you very well know, that no human is more than human, and no Englishman wants England to lose India - not even those, who see Indias rights as clear as you. Now certainly you have been filled up with peoples sayings and you shall hear no more. I am on my way back to Denmark, where I shall let my friends make me a member of the board of my paper Politiken. During this year I shall stay in Copenhagen and try to make the paper a little less yellow and a little more truthful. If I can do nothing, I must make The Friends of India larger and broader and leave the others alone. Of course I shall go to London for the round table. In a few months the first of my sons shall be in Denmark. I gave him a Danish teacher in Calcutta, and he writes me, that he is quick to learn and will be able to go, when he receives my answer. 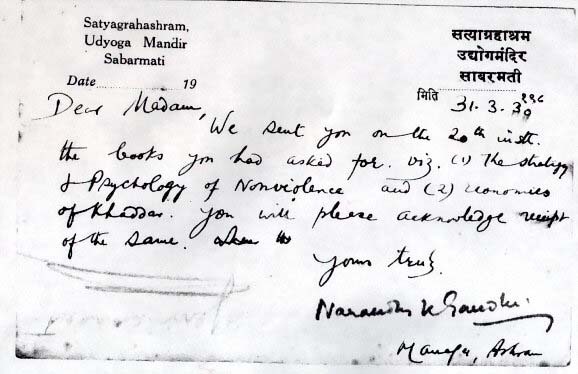 … letter written by Mrs. Menon2 to Mr. Rosenkjar, which he wrongly told me was written by Mirabai3, there was one thing that impressed me very much. 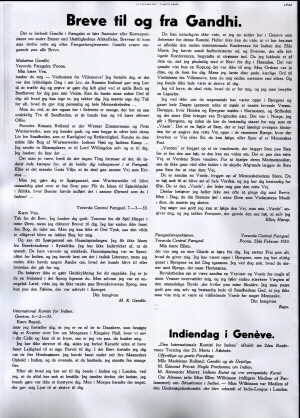  Mrs. Menon asked Mr. Rosenkjar, who had invited you to Denmark.  answer this question by inviting you myself in the name of the Friends of India in Denmark. You can trust us. We will all of us do everything to accommodate you and your little company as well as possible. All the societies, whose work is on line with your ideas, will join us and make every effort to arrange meetings private and public so as to give you the best opportunity to come in touch with the people, you may wish to meet. Needless to say that every expense will be met by us. We will, if it suits you, arrange a big mass meeting with an entrance fee, where the whole income will be given to you for your spinning wheels, for your hospitals or whatever purpose you may choose. We who have been in your Ashram know what you want and we will only be too glad to be given an occasion to show you our admiration and our love for you and for your motherland India. I hope you will be kind enough to tell me as soon as possible if you accept this invitation and  as soon as you know it  the approximate date of your arrival. When I tell you, that I am one of the two Danes which visited you quarter past four in the morning in Kingsley Hall, where we slept in your cell, then I am certain that you renember me4. I have not written to you since I left Karachi without the opportunity to say good-bye to you5. In that letter I told you about the four Hindu sons I have gotten during my four months residence in India6, and you answered, that you hoped that I got many more. After all what I have seen to you both in India and in London, I know, that you always are busy. Therefore I thought, that the best I could do was not to disturb you. But during the morning something happened, which gave me desire to write to you . Of course you cant know that now I am living in Geneva as secretary for this committee. Neither can you know, that we have decided to hold the second international conference for India on March 23. I have just mailed the invitations and the answers, which all accepted the conference are rolling in. When I opened one of them I suddenly sat with a letter from you in my hand. Surely, just a copy and it was not to me. But the words were yours, and they came from you. While I read your good, loving words to the violinist from Villaneuve7, you came even closer than before to me. And I could not resist to write to you. I will, that you shall know, what you means to me, and I must use a parable. I dont know, if you ever have been up in the hills and walked a whole day through without meeting a living creature. Up there, where the heaven and the hills meet in the horizon and the silence and the great emptiness brings one the eternity closer. It was in Norway, I walked in the hills and ever since you are for me a cairn, which is a heap of stones set up as landmark, laid roughly upon each other to suggest the right way up in the lonely hills, where there are neither road nor path you can follow, or trace of a human foot. The cairn is built by the travellers, which heap stone upon stone to make it so high, that it can be seen far. It is on the right path, that the great of the world travels. To help their fellow human being, so they dont walk wild or fall into hidden abysses they heap stone upon stone to show them the way. You are such a cairn, built by the great of humanity. You are high enough to be seen by the whole earth, and always I have my eyes for you. You are the cairn, which leads me on the right path. I dont need therefore so often to annoy you with letters. But today, when your voice sounded in my ears as the violinist in yours, then I had to write. I was delighted to hear from you. I appreciate all your affection. I have gone up hills but I have never walked along them all day long but I do know however what you mean by the mountains reaching the horizon. The knowledge that I am a guiding varde8 to some friends humbles me and makes me more and more conscious of the tremendous burden that I carry on my shoulders. I have to watch myself and incessantly pray to the God of Truth that I may not prove a false guide to anybody. INTERNATIONAL COMMITTEE** SENDS SYMPATHETIC GREETINGS. *On April 30, 1933 Gandhi issued statement about an unconditional and irrevocable fast for twenty-one days from May 8, 1933, for the purification of self and associates. **The International Committe for India at Geneva. I have your letter which I was glad to receive. I have no time to give you views. I shall see Barbaro when she comes. I hope your faith will never waver under the stormiest weather. Fair weather face is no face. Source: In the files of Holger Terp. 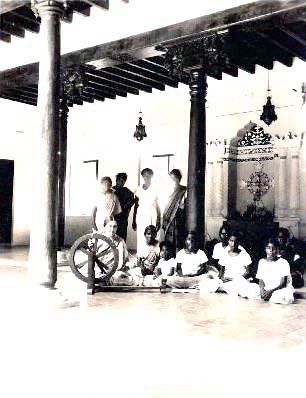 1 Narandas, a nephew of Mahatma Gandhi, was manager of his ashram. 4 The second Danish woman in Kingsley Hall was Cathinca Olsen. 5 The letter she sent after leaving Karachi and Gandhis reply are not available. 6 Ellen Horup adopted the four Hindu boys at the school of Anne Marie Petersen in Porto Novo. This was mentioned in Horups Gandhis Indien. Rolland took a book from his shelf and read from Goethe. Gandhi asked Rolland to play some Beethoven. Rolland played the Andante from the Fifth Symphony. The Theme of the Fifth Symphony is considered to be man's struggle against Fate, man's harmony with Fate, and the brotherhood of man. The second moment, the Andante, is melodius and suffused with tender lyrical emotions. Rolland chose it because it came closest to his concept of Gandhi's gentle and loving personality. Rolland saw Gandhi and his party off at the railway station. There they embraced, as they did when they first met. Gandhi pressed his cheek against Rollands shoulder and threw his right arm around Rolland. Rolland touched his cheek to Gandhi's head. It was the kiss of St. Dominic and St. Francis.